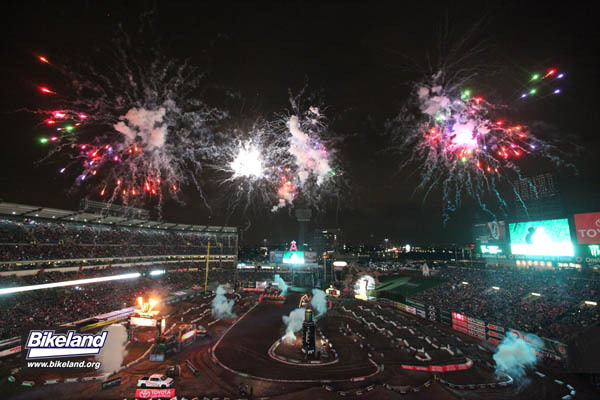 The Monster Energy Supercross Series returned to Anaheim for its third round with the toughest track riders had seen in a long time. Totally different from the A-1 course here two weeks ago, tonight’s layout featured the longest whoops and rhythm sections seen yet. With no straights and tightly spaced triple jumps, the track gave riders and machines plenty to deal with. 250 West series leader Cooper Webb continued his win streak but it was no easy ride. After two years away from the series, Christian Craig returned and put the GEICO Honda in front of Webb for the first time winning Heat #1. Fastest qualifier Zach Osborne on a Husky was bested in Heat #2 by Joey Savatgy’s Kawasaki and Jimmy Decotis on another GEICO Honda. After getting off the line fourth in the main, Webb methodically worked his way up. Savatgy running second, crashed allowing Webb to catch early leader Craig and the two proceeded to swap the lead multiple times delighting the 42,943 Anaheim fans until Webb finally got control in lap 11. Zach Osborne worked by Craig on lap13 to finish second overall. It was the third time Webb has led only four or five laps to clinch the win. Due to lingering effects of his Anaheim 1 crash, Yoshimura Suzuki’s James Stewart elected to sit out Anaheim 2. Stewart reportedly plans to return to action next week. The 450 pack got a surprise when Davi Millsaps grabbed Heat #1”s hole shot and held off hard charging Chad Reed and Honda’s Cole Seely for his first win of the year. Suzuki’s Ken Roczen needed a break out night and he got it started with fastest qualifying and then a hole shot in heat #2. An early bobble however let Series leader Ryan Dungey get by Roczen for the heat win. Eli Tomac, still looking uncomfortable on the new Kawasaki, was also charging but couldn’t stay with Dungey or Roczen. In the main event, Millsaps again led the field but after three laps Dungey went by, followed quickly by Reed, Tomac and Roczen. None could keep Dungey’s pace but their three-way battle for second climaxed on the final lap with Tomac going down leaving Reed a comfortable second and handing Roczen a badly needed third. It was two in a row for leader Dungey but Reed’s ride now bumps him up to second overall in the standings after Jason Anderson finished a disappointing fifth. The fun continues next weekend in Oakland. Hoping for a boring night. Being on a Wheaties box makes you popular. Winning two Supercross Crowns doesn’t hurt either. Nothing like having nine-time Women’s MX Champ Mercedes Gonzalez Natvig help you gear up. Trey Canard has time for the beach? Yeah, I do need to see your credentials. Who says privateers don’t have fun?